Now this may sound like your mom, but clean, ironed clothes are a must. Dragging yourself into the office in crumpled, stained clothing – especially from the night before – is an absolute no no. If you are the sort of person who gets caught out like this on occasion, perhaps keep some spare clothes under your desk. Women should always make sure their skirts are of a modest length, and that not too much cleavage is on show. You’re here to work and project a professional image, and although you may get a lot of male attention dressing provocatively you certainly won’t be getting any respect. There is nothing wrong with showing your femininity, but keep the skimpy clothing for your social life. The same goes with bra straps, make sure they aren’t on show and that if your shirt is a bit on the see through side, you wear a slip underneath. Investing in a tailored suit for those all important job interviews or power meetings is a good idea. From time to time you may need to dress to impress. If your budget doesn’t stretch that far, try to find a well fitting suit from a retail shop and keep it in good condition. 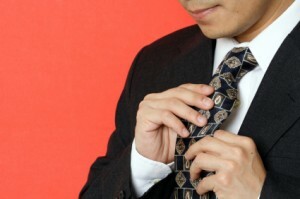 So keep your shirt collars clean, buttons sewed on and iron your work clothes. Shoes should be kept polished – you may not be in the army, but in your professional life you’re under inspection at all times. This entry was posted on Friday, September 19th, 2008 at 2:05 pm	and is filed under Employment Regulations, Office Etiquette, Office-code-of-conduct. You can follow any responses to this entry through the RSS 2.0 feed. You can leave a response, or trackback from your own site.